In this demonstration we measure the standing wave ratio (SWR) of a load, in this case an UHF antenna. A constraint is that we want to do this in a cost-effective way up to 1.7 GHz. My earlier discussed VNA is not capable of doing this, you can get VNAs that can but they rapidly become rather expensive. In the demonstration video we generate noise with a tool that essentially amplifies the noise of a zener diode, you could make it yourself, but if you google for BG7TBL noise generator then you will soon find out it is easier to order it than to build it yourself. Noise from the BG7TBL tool has the property that it is random phase by frequency and that the amplitude is somewhat constant over the entire spectrum. Put it on the scope and you get what you expect: something that resembles white noise. The tool needs up to 12 Volt to operate, it will get hot, but it also works on a 9 Volt battery. If you insert noise in the SDR (I used my airspy) then it will fill the entire HF VHF and UHF spectrum, and you may wonder why you would like to do that at all. Please insert attenuators because the output of the BG7TBL tool is rather high, so I added 30 dB attenuation before I did the measurement with the SDR. When I measure the reflection properties of a load then 10dB goes before the bridge, and 20 dB goed after the bridge to prevent that the bridge is influenced too much. There is a very good reason why you would like to insert artificial noise into your SDR. The reason is that it allows you to measure the performance of filters or loads connected in between the source and the receiver. In the video we inserted a RF bridge between the source and the receiver. Nothing is connected to the DUT port, in this case the signal reflects back into the RF bridge and this is picked up by the receiver. The throughput is called the directivity of the RF bridge. (for details see the discussion on the transverter-store web page). The DUT port has a dummy load of 50 Ohm (or the same amount of Ohm as the reference port). In this case you will notice that no signal will pass the bridge and that everything is dissipated in the dummy load at the DUT port. Connect an unknown load to the DUT port, and now you will see that some of the signal is reflected back to the receiver, but that the rest of the signal is dissipated into the load on the DUT port. I measured on the waterfall a reflection loss of 20 dB near 440 MHz, this is compatible with a SWR of 1.2, the connected antenna is a miniature version of a 70 cm amateur band antenna. 90 degree hybrid coupler from Technical Concepts, its center frequency is 500 MHz, so close to the 70cm band. 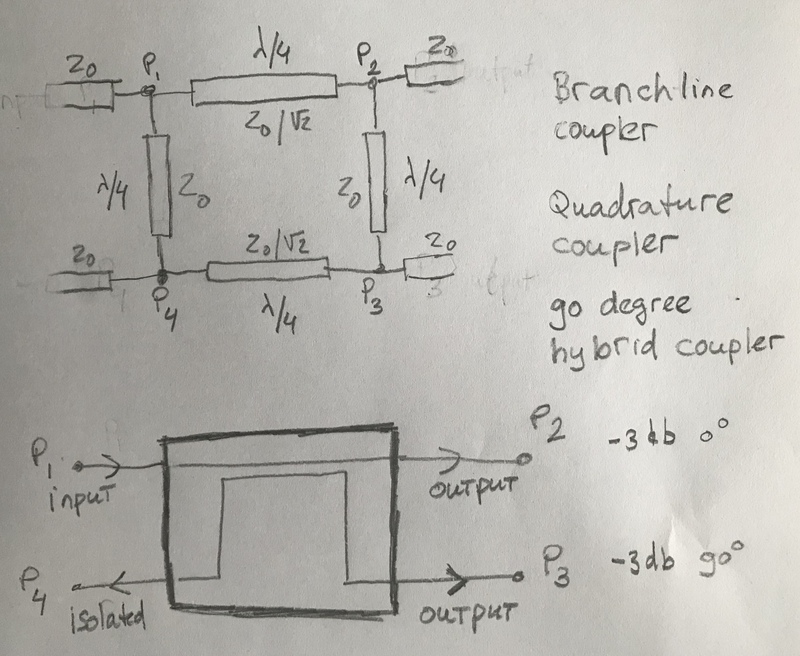 And this is the replacement schematic of the 90 degree hybrid coupler, they are also referred to as branchline couplers or quadrature couplers. The purpose of the 90 degree hybrid coupler is to split an input signal into two paths, one is essentially forward with 0 degree -3 dB and the other is also forward but then 90 degree phase shifted. There is also an isolated port, anything that is reflected in the system ends up at P4. To turn this into an RF bridge for measuring SWRs you connect the noise source to P1, the antenna to P2 and a 50 Ohm dummy load to P3. You could interchange P2 and P3, the device is symmetric, it has no effect on the SWR measurement. I use SMA 50 Ohm coaxial dummy load, you find them on ebay where they are a lot more affordable compared to buying them new. The SDR (preceeded by a 20 dB attenuator) is connected to port P4. For 70cm antennas this approach works, but don’t try this for frequencies that are far off the 500 MHz because the bridge 90 degree hybrid coupler was not designed for this. A more extensive discussion about 90 degree hybrid couplers can be found here. I don’t see the attenuator in the video. Was it connected after the video was made? I’m very interested in building one of these myself! 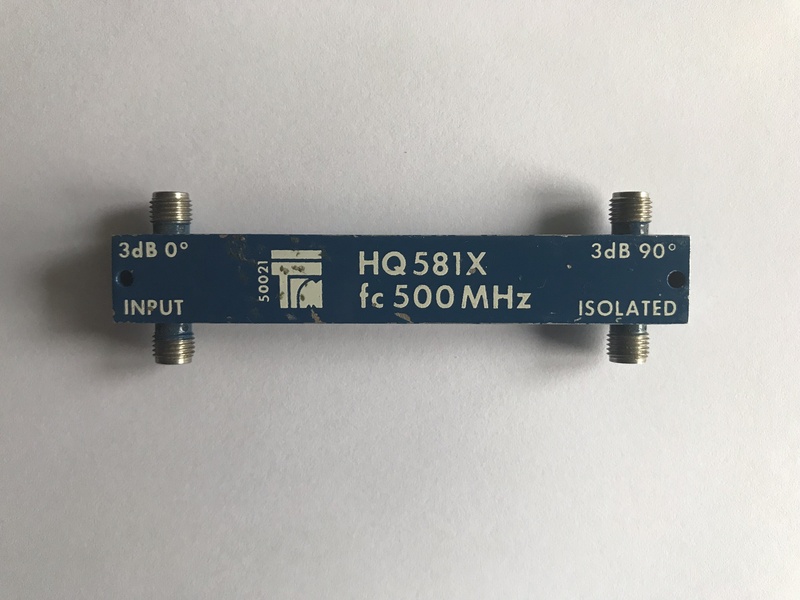 There are SMA sized attenuators before and after the RF bridge (10 and 20 dB), you need them to isolate bridge from the rest of the experiment, and to reduce the signal because the output of the noise source is fairly high. Ok, now I see them. Thanks! Is there a way to measure the impedance of the antenna using the SDR and a noise source? Formally the impedance is a complex variable, if you have an VNA then it will measure this. If the antenna has a real impedance then the SWR approximates to R/Z0 where R is the impedance of the antenna and Z0 the characteristic impedance of the cable.